I hope you like my Halloween door hanger as much as I enjoyed making it. One side welcomes you in for a "bite", while the reverse lets people know you've gone out haunting. The sentiments were typed digitally on top of Amanda's "Spider Web Pack Papers" which you can find HERE. Her great Turtle Digi Stamps make this a really cute and quirky project. You'll find these two turtles and more HERE. Card Designer - Vincent Ballard. Turtle Digi Stamps - Amanda Marks. Background paper by "We are memory keepers"
What a great hanger and so love the colours. This is awesome, Vince! At first I thought it said "bite me" :) Cute as can be and I love Amanda's digi background. Your design is perfect, thanks for sharing. I love these! I really like your double use of the ghost turtle to create your trick-or-treaters. 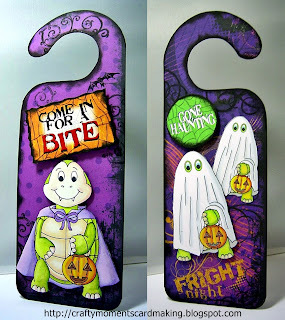 Wonderful door hangers. Love the bright colors.